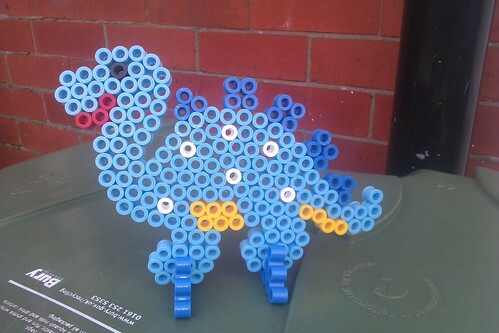 I have been intrigued by Hama Beads since I saw my nieces making amazing pictures with them about six years ago. They spent hours placing their beads, and then waited patiently for their mum or dad to iron them. Many Hama bead decorations can be seen on display in their home in Luxembourg. When we were given the opportunity to try some Hama Beads ourselves, I was intrigued to try these melty beads, that stick together when you iron them. I was a little nervous too, as up until recently Joseph has not shown any interest in craft activities. We were sent My First Maxi beads to try. Inside the pack is a plastic template which shows you how to place the beads, a bag of beads and some ironing paper. Joseph got the hang of it right away, doing the eye first and then moving to the tail. He really loved it, but his attention span is quite short and mummy ended up finishing him. Once he was finished, Joseph declared his name was Eggy and he went over to the ironing station. You really have to iron this creature. It took me a while to get it right. Once its ironed leave the paper on, and the weight your creation for it to dry. The melty beads do have to really melt to stick together and I think it will take a couple of goes to get it right. I was really impressed with our first attempt at Hama beads. As you can see I rushed a little toward the end and forgot his yellow chest!! 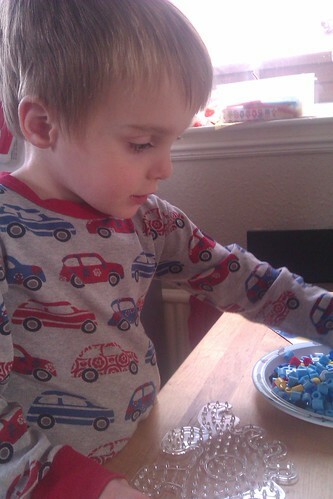 I really enjoyed our first go at Hama beads and look forward to showing you another kit we were sent next week. I can't wait to further explore the range of ideas from Hama, have a look at the Pinterest board that Craft Merrily has lovingly put together. I would highly recommend the maxi beads, and am definitely putting some on Joseph's Christmas list. 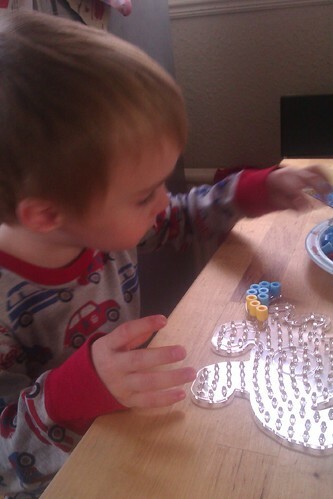 He really enjoyed his project and I am sure he will become more proficient with creating with Hama beads. 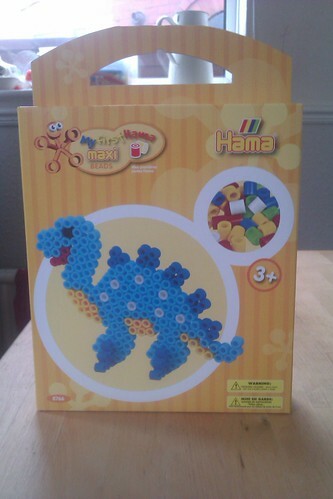 I was sent the Dinosaur My First Hama maxi bead kit to review, all opinions are my own. Or that of a 3 year old!